Considered one of Italy’s most talented poker players, Sergio Castelluccio has fallen just short of earning one of the huge scores that changes the life of every player. First, in 2012, Castelluccio almost left Monte Carlo with the European Poker Tour (EPT) Grand Final Main Event trophy in his bag. He was the chip leader with four players remaining but quickly lost all of his chips and watched Mohsin Charania come out victorious. Then, in 2013, Castelluccio travelled to Las Vegas to play in the World Series of Poker $10,000 buy-in Main Event. Although this time the field was 10 times bigger than in Monte Carlo (6,352 entries), Castelluccio made a deep run and was in contention to become the first Italian player to bring home the most precious bracelet in poker. Unfortunately, again, his majestic run did not finish as he wished, and WSOP Main Event ended with a still-honorable 14th place finish for $451,398. Ninth on Italy’s all-time live tournament poker money list with total live earnings of $1,740,896 according to the HendonMob, Castelluccio recently sat down with PokerNews during EPT Deauville to discuss his past results, sponsorship deals, and what he calls his "biggest regret in poker." PokerNews: Your career in poker includes great runs at the EPT Grand Final in 2012 and at the WSOP Main Event in 2013. Looking back at those tournaments, how do you think they have changed the way you play live poker? Castelluccio: If we talk about the way I play poker, I’d say that none of the two episodes you mentioned really changed my approach to the game. Evolution, in poker, is a gradual and progressive process - and that has been happening before those two results, and it kept happening after them. I believe that the way you change your approach to the game is not related to a specific big (or small) result, it’s rather part of the 'natural' evolution of things. However, I can’t deny that those have been two very important moments in my poker life. To be completely honest with you, I may even tell you that one of them is probably my biggest regret in poker. Which one is it? The final table in Monte Carlo, or the missed one in Las Vegas? By far the one in Monte Carlo. When I got there, when I reached the final table, I felt that I could make it. I thought I could really bring home the title. When we were down to four players, we had two inexperienced players at the table and I had the chip lead - that made me feel almost like if I had the heads up in my pocket already. Then, unfortunately, things went differently. I played one hand the wrong way, I was unlucky in another spot right after that, and the game was over. That’s how it went. Truth be told, I never imagined that I would be the first one to leave out of the four still battling for the title, and that made me feel really bad. As for Las Vegas, I didn’t take it as bad as in Monte Carlo, probably because the field there was far more competitive and I didn’t sit at the table thinking that I could almost simply just walk to the bracelet. I believe that when things go like they did in Monte Carlo, you must take a significant psychological hit. How do you react to that? Well, there’s not much you can do about that - once you are out, you are out. You don’t need to find a way to 'overcome' that, you just have to deal with it and go on. Sure, you are certainly not happy and you tend to look for someone to talk to, someone you can tell how things went and you can comment your hands with. The key is to know what you did wrong and to learn from that - that’s really the best thing you can do. As for me, personally, I can tell you that that’s how it went. I know the mistakes I made and, hopefully, those helped me to learn a lesson. On a completely different note, a month from now the Global Poker Index will launch the first edition of the Global Poker Masters, something that aims to become poker's 'World Cup.' Italy will be there with Mustapha Kanit, Dario Sammartino, Andrea Dato and Giuliano Bendinelli - what’s your opinion about this event and the idea to turn poker into a sport? I don’t think poker is a sport, and I am not sure it will ever become one. To change how things are today, we would need to create something different, something perhaps along the lines of what the GPI is trying to do. For poker to become a sport, we need sponsors to jump in and offer something new. I am thinking of a big prize pool that the best players of the season would share among themselves. And we would need to create something looking more like a league - as it happens in most sports today. As long as individuals need to pay their own buy-ins and as long as anyone can compete against everyone, this is not going to happen. Now that you have mentioned the role sponsors could have, what’s your opinion on the way poker sponsorships work today? Between the end of 2014 and the first two months of 2015 we have seen deals being ended like never before. Why do you think this happened? Because a proper poker sponsorship, in 2015, is nothing more than a mirage. It’s something that simply does not exist. If you go back to when Italy launched the 'dot-it' poker market, everything was different than how it looks today. All the poker rooms wanted to get some visibility, and this meant that basically every player who had a bit of visibility in the country got a contract and a patch from a sponsor. I am sure that this has somehow paid off and the poker rooms got some kind of return from this strategy because I am sure that some names have actually worked to bring new players in the ecosystem. As for today, things are simply going in a different way. The poker rooms have basically no return from the sponsorship deals the close with people, and that’s why they have all started to cut many members of their teams. Again, if you look at Italy, it’s fair to say that we almost don’t really have any 'real poker sponsorship' anymore. That time is over. I think it may be fair to say that one of Italy’s last real sponsorship deals is the one Max Pescatori has - and he deserves that. But isn’t that because we also miss real characters, people that can make the game become something a lot bigger and more entertaining than a card game? When I think about Italy, I somehow still feel that I have to go back to Dario Minieri to find someone like that. Am I missing someone? That’s correct. Dario Minieri was someone who would really make a difference because he was a character. You may not like the way he played poker, but he was a real character at the table. Think about the time he got to join High Stakes Poker and he sat at the table with all those great names and play for those incredible amounts of money. At that time, Dario represented a world that back in Italy people could only dream about. Today, I have the feeling that we don’t have anyone like him. The difference in popularity between Dario and the second in the list is enormous. He’s been something incredible for poker. He was a young and aggressive kid who was able to make the game hard for everyone, regardless of their name, age or roll. At that time, his way of playing poker worked pretty well - and that’s why it gained him also some very significant results. Minieri or not, numbers say that the game is no longer as popular as it used to be only a few years ago. Are people simply getting tired of the game? I am not sure about that. If you think about the live game and you look at how things are in Europe, the so-called crisis of the game is almost solely an Italian affair. In Deauville, we have seen 592 players at the EPT Main Event and 1,355 players in the France Poker Series Main Event, and something similar happened also in Barcelona and Prague. So, I would say that one of the main problems for live poker in Italy is bad management. As for the online game, it has simply happened what every experienced player knew was due to happen: the system has imploded. If you regulate the market by closing it to the outside and at the same time allows basically anyone to get a license - you are clearly doing something wrong. The number of player is not going to grow from one day to the [next], and this means that the only thing that can happen is that the small poker rooms will not have enough liquidity to survive, and those two or three big operators that can still find a way to make a profit out of the game will consolidate their dominant position. You said that one of Italy’s biggest issues is 'bad management.' Do you think this is the reason why the EPT decided to take Sanremo off the schedule and move to Malta? Also, how does that make you feel - are you sad or happy about that? As an Italian player, I would obviously love to have an EPT in Italy. Yet, seing how things went in Sanremo during the past years - I think Malta is a much better location for an event like that one. I like the location, I like how they treat players, and there are some nice deals that allow players to stay at the Hilton hotel without paying some crazy-high prices. In Italy, unfortunately, things always went in a different way. When you have a big event, even the shabbiest hotel tries to increase the room’s prices as much as humanly possible to squeeze money from the players. Then, once you go to the casino, you are treated with no regard at all. You may sit to play for the whole night, you may have €10,000 on the table - but you still have to pay even for one single espresso. They don’t seem to realize that they actually make money when you still there to play. Unfortunately, I believe Sanremo is just an example of how things work in Italy - we have great things, we have great places, but we don't know how to use them. 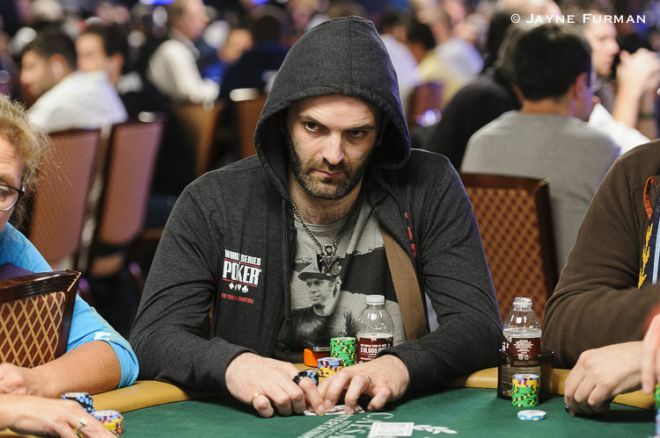 Sergio Aído Gets Ready for EPT Barcelona: "Motivation is Higher When You Play at Home"